Water Melon might be the perfect summer food.Sweet,juicy and refreshing,watermelon is a popular treat at picnics,potlucks and parties.Water Melon is aptly named,since it consists of 92 percent water.The Average American eats more than 17 pounds of water Melon a year,making it the most-consumed melon in the United states. Although usually considered a fruit,watermelon is a member of the gourd family and is related to cucumbers,pumpkins and squash. Egyptians cultivated watermelons more than 4,000 years ago.There are now 1,200 varieties of watermelon grown worldwide. 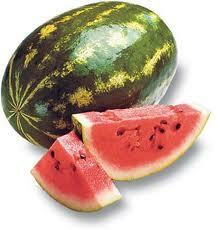 The beautiful red watermelon is also a source of the potent carotene antioxidant which is called lycopene. The lycopene which gives fruits the attractive red color that we find in watermelon can help reduce the risks of prostate cancer. If you are purchasing a cut standard melon, look for bright red flesh with mature dark brown or black seeds. Unless it is a seedless variety, an abundance of white seeds means it was picked before its prime. Avoid those with white streaks through the flesh and those pieces where the flesh is mealy, dry, and/or separating from the seeds. Cut watermelon should be wrapped tightly, refrigerated and used within a few days. According to the Guiness World Records website,the world's heaviest watermelon weighed 268 pounds.The melon was grown by Lloyd Bright of Arkadelphia,Ark., in 2005. 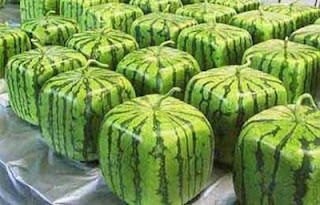 China is the number one producer of watermelons at and the U.S. is the fourth largest producer.